One thing I couldn’t help but notice in my last couple of days away was a flurry of Twitter messages from Boris Johnson, who managed over 50 messages in two days bragging about his trip to New York. I was a few hundred miles south in Washington, so didn’t get to see such delights as him, er, promoting British Airways and Disney. Got a product to shift to those Yanks? Boris is your man – he even handed unwitting New Yorkers free copies of the Evening Standard – you couldn’t imagine his counterpart, Michael Bloomberg, standing in Piccadilly Circus dishing out free New York Posts, could you? But Boris and Mike were there, it appeared, to get to know each other that bit better, including signing a tourism deal between the two cities. But no matter how much he tries to butter up Bloomberg, one difference remains. Michael R. Bloomberg has real power, and is happy to use it. In fact, he’s very keen on it – seizing control of education policy from New York State seven years ago. Boris Johnson doesn’t, and is keen to fritter away his powers. 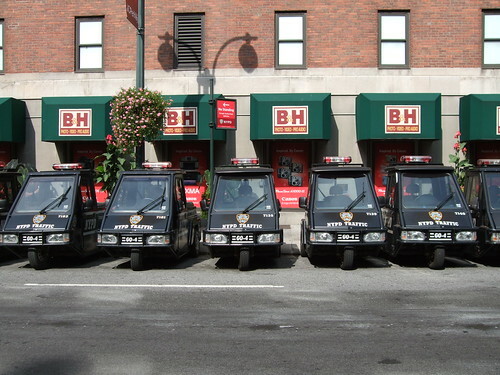 BBC London News carried a line on Tuesday night about Boris thinking he should have more control of the Metropolitan Police, just like his mate Mike in New York does with the NYPD – but the two cities’ systems of government are not even remotely comparable. In New York, the mayor is, unquestionably, the boss. His budget of $50 billion a year helps pay the wages of 250,000 employees. Nearly all public services in NYC are overseen by the mayor – police, fire, streets, social services, education, housing, building control. Whatever “the council” does here, the mayor does there to a level that’d make many people here complain about a lack of democracy. But it makes the mayor a central figure in city life, and puts a huge amount of scrutiny upon the incumbent and his top team. Alongside the mayor is the New York City Council, which both scrutinises the mayor and sends laws for him to sign. Further down the chain, New York has five huge boroughs, each established for well over a century and led by elected borough presidents – but their role is largely to advise the mayor, and to dole out small budgets for special projects in their areas. Below that, there are 59 community boards, whose representatives are unpaid and selected by borough presidents and city council members, but which meet in public to discuss planning and other issues. So it’s a top-down system. In London, power’s divided. The mayor’s role is more strategic and his greatest influence is over transport – but even then, he has little control over much of the rail network. He has an assembly which merely scrutinises his work (as well as other aspects of London life) and can suggest issues for him to deal with (but no more than that). Most of the power (including education, social services, most roads and planning issues) is held by 32 borough councils, founded in the mid-1960s, which are free to govern themselves as they choose and tend to be major employers in their areas. While New York’s run in a relatively consistent fashion, London’s power is all over the place. If Boris became mayor of New York (he was born there, remember, so you never know…) he’d be packing his powers off to Manhattan, Brooklyn, Queens, Staten Island and the Bronx. While if London had a Bloomberg figure in charge, he’d probably be trying to seize control of social services because the likes of Haringey can’t do it properly. 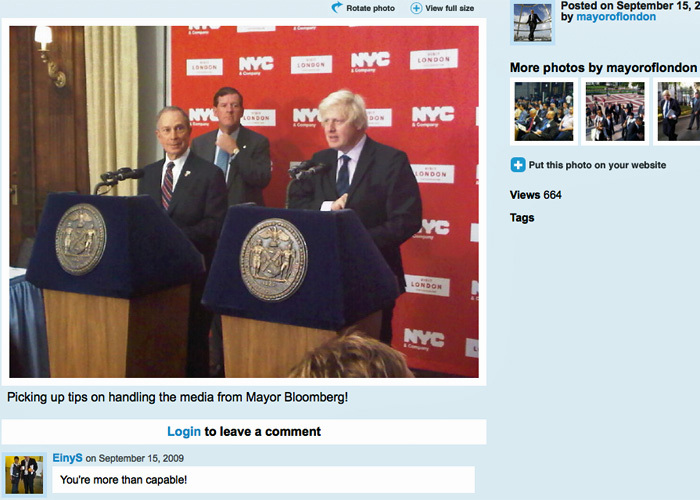 Boris’s adoration of Michael Bloomberg looks embarrassing once you’ve compared their respective offices. No government in a million years would trust a London mayor with the powers Bloomberg has, and Boris’s own party would squeal with horror at the thought of the mayor taking on more responsibility. To give a local example, earlier this month Boris wouldn’t even countenance intervening in Greenwich Council’s plans to refurbish the Greenwich Foot Tunnel, despite the fact that the foot tunnel is of great importance to a huge chunk of east and south-east London, and that Greenwich’s management of the project has been typically cack-handed. Could you imagine Michael Bloomberg sitting back and letting a small council screw up people’s journeys to work like that? And this is what makes watching Boris try to ape Bloomberg so funny – like watching a little boy put a bit of carpet on his chest and pretend to be his dad. Compared to Bloomberg, Boris is the boss of a small parish council. Other city mayors are showing the way – Toronto’s David Miller is banging the drum for Canada’s largest city to be the world’s greenest. But what’s Boris doing? Whoring himself out to British Airways to promote transatlantic flights. Ooops. It doesn’t help, of course, that London’s media seems to swallow any old cobblers that mentions New York. 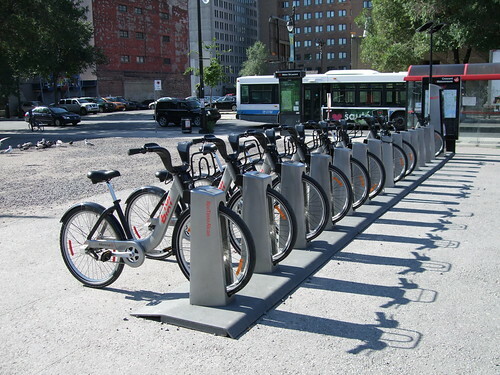 This story in the Evening Standard about New York wanting to follow London’s “lead” in introducing a cycle hire scheme didn’t quite ring true – since what London’s adopting is Montreal’s BIXI scheme (above), which happens to be on the same continent as New York. It’s also being adopted three hours away from NYC, in Boston. And of course, London lags behind Barcelona (whose scheme is used by Washington), Paris, and any number of other cities. But it says New York! Get it into the paper! Seriously, Boris, when you’re ready to take on real power, then come back and hobnob with Big Mike. Until then, please, stay in London and get on to do the job you were elected to do. Like when you declare yourself chairman of Transport for London, and then the Tube map gets screwed up – shouldn’t you have been on top of that? If he can’t look after little things like that – who’d trust him with the police? My feeling was that Ken was as keen on London local government reform in his second term as he was in the first, certainly he continued to hold local councillors in pretty low regard. But your broader point about the powers the Mayors have and how they use them seems about right to me. I recently listened to this podcast in which the Mayor of San Francisco is talking about his city and wondered whether there was anyone in local government in the UK who could match the strategic vision and grasp of detail that Mayor Newsom articulates. Oooh, thanks for that, Andrew – I’ll take a listen.